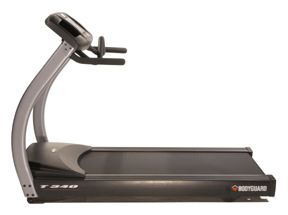 Bodyguard T340 Treadmill Consumer Review - THE BEST!! I've had the Bodyguard T340 treadmill for a few years now and it is perfect. It is quiet, smooth and has enough programs to keep me challenged. Knock on wood, I've used this treadmill five days a week during the time I've had it and it still runs perfectly. I looked at the Landice treadmills and for the price, the Bodyguard won hands down. I have owned a Bodyguard Champlain treadmill for 10 years and have loved it!!! In that time, I have used it to train for 15 Ironman's and 16 marathons. It is still going strong and I have never had any "down" time or problems. Now, I have decided to upgrade to the 460XC since it has some upgraded interactive features and I can program race courses into it including up to a 3% decline. It is very quiet and smooth. 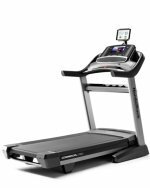 These treadmills and their shock absorbing qualities are the reason I have been able to continue to do longer races with minimal injuries. I can't recommend Bodyguard and their quality more highly - THANK YOU! I am wanting to sell my 2002 Bodyguard Radisson Treadmill and am wondering what a realistic asking price would be. It is in very good condition. Any suggestions?